Sheffield came to a standstill this morning as thousands of people cheered the arrival of the Queen. Crowds were a dozen deep in places around Sheffield Cathedral, with people clambering on to walls, railings and bins in an attempt to get the best view. People cheered and waved Union Jacks as the royal party arrived around 11am. The Queen was accompanied on her visit to Sheffield by the Duke of Edinburgh. She arrived in the city at Sheffield railway station, where she was greeted by Lord Lieutenant of Sheffield David Moody. After the service at Sheffield Cathedral they attended a civic lunch at the Town Hall. Many people had waited hours to get a good view of the royals as they visited the city. The first to arrive, at 6.40am, was 71-year-old Hazel Wright, from Ecclesall. Mrs Wright, a member of the choir at All Saints Church in Ecclesall, said she has waited all her life to see a member of the Royal Family. A 90-year-old member of her church has been invited to attend today’s special service at the cathedral, where the Queen will hand out silver coins - known as Royal Maundy - to South Yorkshire pensioners. Mrs Wright said: “I am very excited to be here because I have never seen the Queen or any member of the Royal Family before, so I thought I had better get up early and get my place. Isabelle Sheriff, 18, from Elsecar, Barnsley, was one of the first spectators to arrive. The Longley Park Sixth Firm Centre student said: “I only found out about the visit at 11pm last night when my sister told me the Queen was coming so it was all a bit last minute but I decided to get up early to try and see her, and left home at 5.10am. Among those in the crowd were Martin and Jenny Coward, who had travelled from Surrey. They were there as Martin’s mother Jean Coward, 89, was among the pensioners receiving Maundy money from the Queen. Jean, from Doncaster, was nominated for the honour as a thank you for being a stalwart at her church in the village of Askern. They said they had managed to get a glimpse of the Queen arriving and it was a ‘great honour’ for Martin’s mother to be among those getting the money. Kathryn Wileman, from Rotherham, was there with her 20-month-old son Henry. They were there in support of Henry’s great-grandfather Alf Wileman, another of the pensioners meeting the Queen today. Mr Wileman, 87, has been in The Salvation Army’s Sheffield band for nearly 70 years and has spent many years mentoring young people through his musical talent and spiritual guidance as the Junior Band Leader at Sheffield Citadel. Kathryn said her grandfather was ‘absolutely delighted’ to have been selected for the honour. She said she hoped Henry would have good memories of the day when he is older. “It is the story behind it, to be able to say we were here and we saw the Queen,” she said. Also in the crowd were parents Matt and Kelly Wooller, from Dronfield, whose son Alex was born on the same day as Prince George. They also brought along their neighbours’ daughter Eden Kus, six. Student Ben Allsop, 21, arrived in the city centre with a pal at 7.30am complete with deck-chairs and a flask of tea. “I’ve got tremendous respect for the Queen really, we wanted to come out and see her for real. She’s not getting any younger either,” he said. “From what I gather she’s never done the Maundy Thursday service in Sheffield so it’s a special occasion for everyone. Cassie Mohney, 25, from Michigan and Carolyn Spelt, 22, from Canada, who are both studying at the University of Sheffield, were among the first to bag a spot outside the cathedral. Julia McCarthy-Fox, 50, her friend Jim Fairman, 69 and Julia’s Godson Charlie, four, travelled from Sussex for a glimpse of the Royal party. Anne and Peter Grant, from, Hillsborough, arrived at the cathedral at 8am. Mrs Grant, 57, said: “It’s the first time I’ll have seen the Queen but Peter worked for the river police in London for 31 years so he’s seen her a fair few times. Following the service, the Queen and Prince Philip were flanked by members of the King’s Bodyguard of the Yeoman of the Guard, in full red uniform. Members of the 148 Barnsley Squadron Air Cadets, who had earlier formed a guard of honour on the Queen’s arrival, again stood outside the cathedral. Watching with pride was Susan Richmond, who son Samuel, 14, was taking part. He began the day assisting at the Meadowhall tram station before forming the guard of honour. The Queen collected flowers from children before driving to Sheffield Town Hall, where the Royal couple were due to have lunch with civic dignitaries and invited guests. The crowd burst into spontaneous applause as the couple waved as they drove away from the Cathedral. Outside the Town Hall large crowds greeted the couple once again, including Claire Rose, 31, of Sheffield, and her sons Benjamin, nine and Joshua, eight. Mrs Rose, a former forces’ medic, met the Queen in 2003 at a remembrance service for those who died in the Iraq War. Many of those outside Sheffield Cathedral were members of the same church as those chosen to receive the Royal Maundy. David Hopkin, rector of Penistone Church, nominated deputy church warden Fred Etherington, 77, of Penistone. Mr Hopkin said: “Fred has done a lot of work over the years for the church and very much deserved it. He takes tours to Belgium and France to visit war graves, and that is why he was chosen. He not only takes tours, but comes back and speaks to children in schools and his experiences. Also from Penistone Church was Margaret Rothwell of Holmfirth. She was also in the crowds when the Queen distributed the Royal Maundy at Wakefield Cathedral in 2005. Jan Travis, a member of St Peter and St Paul’s Church, in Barnby Dun, Doncaster, come to see two of her church members receive the coins. Pamela Hodgson, from Beauchief Abbey church in Sheffield, came along as a retired canon minister from the Abbey, Trevor Page, was among the recipients. The crowds were full of families, many grandparents who brought their grandchildren to witness the event. Kent and Victoria Holroyd, of Hackenthorpe, brought their six-year-old daughter Poppy along. At the age of nine, Mr Holroyd had waited for eight hours in the pouring rain to see the Queen when she visited the city in 1978, and wanted his daughter to have the same experience. Margaret and Peter Marsh from Woodseats came along with granddaughters Emily, seven, and Daisy, four. Mr Marsh first saw the Queen outside Sheffield Wednesday’s football ground in the 1950s. Mrs Marsh likened the atmosphere to that of the Olympic Torch relay, which the couple witnessed in a soggy Dorset while on holiday. Among those to receive the Maundy coins was D-Day veteran Denis Gratton, 91, from Sheffield. Police chiefs cancelled holidays to ensure there were enough officers on duty today. They also drafted in officers from others forces to boost numbers. 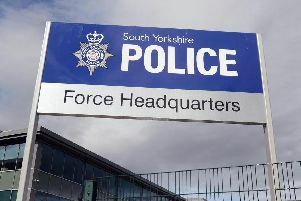 Chief Superintendent David Hartley, District Commander for Sheffield, said: “We are currently unable to put a figure on the cost of today’s policing operation; this will take some time to work out. “As we have known about the Royal visit for some time, we have been able to plan in advance to ensure the cost to South Yorkshire Police is kept to a minimum. “We have achieved this by cancelling weekly leave and rest days and utilising as many of our own resources as possible, including volunteer special constables. Queen in Sheffield for Maundy service.